Tip: Learn which foods help lower your levels of stress and anxiety and build them into your daily meal plan. It will leave you feeling calm, energized and less depressed. Stress is an unavoidable part of modern life. While a low level of stress can energize and propel us, chronic stress actually damages our bodies, leads to disease and depression, and hampers our performance. You may be surprised to hear that what you eat can help manage your stress, but, in fact, foods have a powerful effect on how your body copes. Choosing the right foods can help lower your levels of stress and anxiety, while eating the wrong foods actually increases them. Many foods contain natural compounds that help you relax and deal more effectively with stressors. Turkey and other lean proteins contain the amino acid tryptophan, which is a precursor to the natural feel-good brain chemical serotonin. Dark, leafy greens, nuts and seeds, whole grains, avocados and dark chocolate are high in magnesium, which can help calm your nervous system and relax your muscles. High vitamin C foods, including red peppers, strawberries and broccoli, help prevent the release of the stress hormone cortisol, allowing you to better cope with stressful events. B vitamins are helpful in reducing stress and depression and are found in many natural foods. Avocados and bananas are high in potassium, which helps maintain normal blood pressure. Raw vegetables are an excellent choice for snacking while stressed – crunching on these nutrition powerhouses eases jaw tension and leaves you feeling more revitalized than traditional high-sugar snack foods. While stress-reducing foods can help you regain your sense of calm, avoiding stress-inducing foods is equally important for effective stress management. We often crave sugary foods when tired or anxious; however foods with excess sugar actually tax our bodies further by causing a temporary spike in blood sugar followed by a crash, leaving us even more depleted and stressed. Caffeine increases the already high levels of stress hormones in our bodies. Drink caffeinated beverages in moderation - or better yet, switch to decaf coffee or tea, which has less caffeine and contains the calming amino acid theanine. Many of us turn to alcohol when stressed. While low levels may help ease tension and anxiety, chronic use or overuse of alcohol exacerbates these feelings, as alcohol interferes with the neurotransmitters in the brain that help us feel calm and content. If you choose to drink alcohol, do so in moderation – no more than one drink a day for women, two drinks a day for men. Though it is unlikely we will ever rid our lives of stress entirely, we can reduce its negative effects by choosing smart, stress-reducing foods and avoiding foods that exacerbate it. 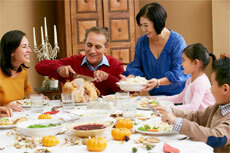 Meal times are built-in moments of respite in our day. Sit down to a plateful of stress-reducing foods and enjoy a period of relaxed enjoyment that will leave you revitalized.